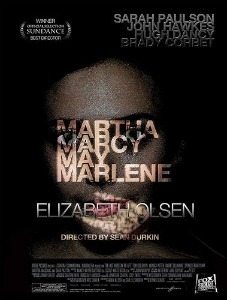 The buzz around Martha Marcy May Marlene recently reached a fever pitch. Director Sean Durkin took home the best director award at Sundance and the film has recently been tapped to screen at Cannes, not to mention that there was quite a bit of attention thrown the way of actress Elizabeth Olsen who is said to shine in this picture, a story of a young woman trying to regain her footing after running away from an abusive cult. Now with a trailer for the film, we can start to see what the hubbub was all about and it certainly looks well earned. Aside from Olsen, the film also starts Hugh Dancy, Sarah Paulson, Brady Corbet and QE favourite John Hawkes as the cult leader. Aside from looking gorgeous, the trailer carries with it an air of mystery and the feeling that whatever Olsen’s character Martha suffered at the hands of the group is much more than her psyche can handle. I’m looking forward to seeing this film and we don’t have much longer to wait; it’s scheduled to open July 10th.